Harashima's car driving into poor's ville again. He gets out the car in the same strong manner he had the other day and looks about the place. He thanks his driver and walks on towards Konosuke's building. Once isn't the delapitated building, he quickly finds the room number and knocks on it. He waits. The door opens and he looks down to find little Shinpai at the door. Harashima smiles in a friendly way you would to a little child and kneels down to his level. "I think I left something here the other day," he explains, he makes the shape of a small circle with his fingers and explains that, "It's a small pocket watch, have you see it?" Shinpai shakes his head, "Where's your dad?" Harashima asks, glancing inside the room. "He's at work but he'll be home soon" Shinpai explains. Harashima asks if he could wait inside for him. Shinpai nods and invites him in. While they wait, Shimpai takes out his pet turtle and plays with it, occationally turning to look at Harashima. He looks around the room and sits silently. The door opens and Konosuke comes in. As soon as he sees Harashima he beams, "Hello! What is it? Taken a liking to this place or something?" Harashima quickly goes on to explain that he was there because he thinks he dropped something there. Konosuke says he hasn't seen it, he turns to Shinpai and asks him if he'd found it at all when he cleaned the room... In the sheets, on the floor, in the veggie rack? Shinpai says no, Konosuke then explains that their room is so small that it would be easy to find... But seeing Harashima looking disappointed, Konosuke won't give up and says he probably dropped it at Hinode. Harashima remembers that's where he fainted and agrees he probably did. Just as they plan to go round and look for it, Shinpai says that he had seen Nahahata feeling about with something in his pocket. Suggesting that he had stolen it. Konosuke won't hear anything of it, saying that though Nakahata may have small eyes but he would never steal. Ironically, just as Harashima's about to speak out against him, Misao rushes in. "Konosuke! You won't believe this... Nakahata has run off with our saleries!" Konosuke laughs, "What, you too? You're right, I won't believe this!" "I'm borrowing this money for a while. I'm sorry. Norihiko Nakakata"
"Can you believe he did this?" Misao says, turning to look at Harashima who says nothing in reply. Despite the fact his opinion on Nakahata wasn't currently perfect, he didn't know for sure if it was in his behaviour. "Whata re we going to do?" she asks Konosuke, who is more concered about Nakahata's name being "Norihiko" then about the fact he'll be getting no pay this month. 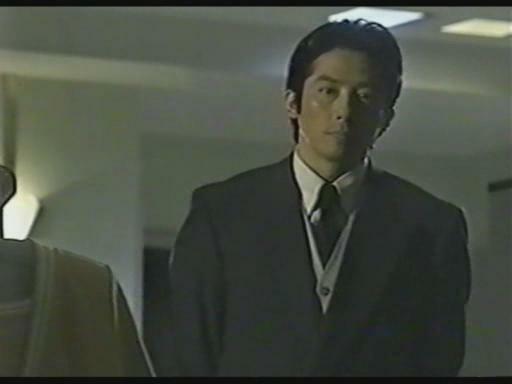 He asks her if she's told the president yet, she nods and he rushes off to Nakahata's place to talk to him. Harashima says he'll come too, seeing as it's possible he has his watch too. Konosuke shakes his head, is he the only one who trusts him? "This must be a mistake!" Konosuke tells Misao as they leave to go. "I'll go over there and talk to him. Don't tell anyone what's happened till I get back!" Misao agrees, and watches as Harashima quickly nods her a bow before rushing off with him. Misao is curious at the strange young man, she turns to Shinpei. "Do you know him?" she asks, Shinpei shakes his head for a 'no', Misao watches him again and smiles in a slightly dreamy way. "He's very handsome, huh?" Misao is snapped out of her trance by the voice of a young woman. (Indeed, you're right) It's Kaori, Misao's little sister, the same girl who was talking with Harashima the other night. However, Kaori just misses him. "Kaori? I thought you were sleeping!" 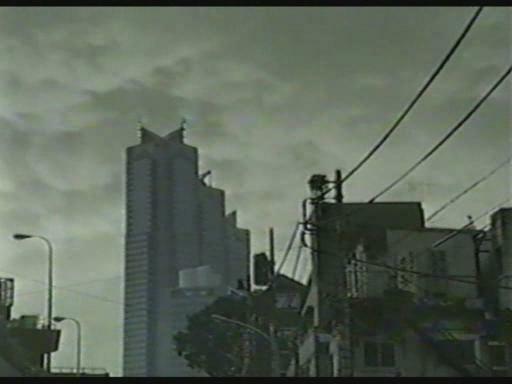 she exclaims, looking nerviously towards Nakahata's building, remembering Konosuke's telling her to to tell anyone... Especially not Kaori. "No" Kaori replies, sucking on her lolly-pop. She is holding backs of shopping, noodles, veggies and more lollies. The sorts of things you'd expect a girl like her to buy at the supermarket. Misao tells her to go to bed and get some sleep, she'd been working all night. Kaori doesn't listen at first, asking if something was wrong but Misao won't tell and says it's nothing she should be worried about so she should just go to bed. Kaori nods and sets off home, not before giving Shinpei a lolly too. He grins at her and thanks her in a perky way that is rare of him. "Night-night, Shinpei!" she replies with a smile. Meanwhile at the crap-pit on the other side of the street, the super is leading Konosuke and Harashima up to Nakahata's room. When they get in, they find that the place is in ruin. He had flead by night. All this clothes, things etc. were gone and so was he. The super asks Konosuke to pay the rent for this month as Nakahata hadn't payed it yet. However, three other men come in demanding to be paid first. They looks like spoilt goods in suits. They come in and surround both Konosuke and Harashima in an attempt to intimidate them. While Harashima doesn't seemed vexed, Konosuke is nervous. "Are you with a bank?" Konosuke asks, trying to make a light-hearted break on the ice. Everyone around him starts laughing, except for Harashima who looks at each one of the men, knowing this was nothing but dirty dealings. The larger one bashes the wall near Konosuke's head. "Do we look like we came from the bank?" the leader asks. Konosuke shakes his head, as the leader calls the cheesy one who had been hanging next to Harashima to bring the papers over. They ask if they should calculate the amount due, and they ask for Konosuke Shimodaira. Harashima's eyes widen and he seems to feel Konosuke's worry. They all start laughing again, but not for too long. "So you're the one, are you?" he shows Konosuke the papers, "You're a very kind friend". Konosuke gasps in disbelief at the depts of his friend Nakahata, realising they were IOUs (I Owe You, if you didn't know). When Konosuke tries to convince them that Nakahata hadn't skipped town but gone to the store, Harashima watches at the three men take turns to beat Konosuke up. He rushes forwards but the three men leave at that moment, leaving Konosuke on the floor, in aid of a pick up. "This hurts!" Konosuke declaires once the two of them are outside. "You okay there?" Harashima asks the pained man, as he rubs his back and head. Konosuke laughs it off saying that they just couldn't wait for Nakahata to get back. "You really believe he's coming back?" he asks him, "You don't think it's possible he just took the money and ran off?" Konosuke shakes his head, "No, of course not. You only say that because you don't know him like I do!" he explains, "He may have small eyes, but he can't decieve anyone!" Harashima shakes his head pityingly, "That's cute but in reality... You were tricked made the guarantor for his depts. He won't be come back". He sees Konosuke's upset face and sighs, he takes a seat next to him and explains what a guarantor is. It means that he'll have to pay for all of Nakahata's depts. "So? What of it?" Konosuke asks, trying to to pay attention to Harashima. "Can you repay it?" Harashima asks. Konosuke looks down at his feet rubbing his arm where he had been kicked. He's stuck. He can't repay the dept and he can't get out of this mess without Nakahata. "Don't you think you were careless?" Konosuke explains that after seeing how troubled he was, he couldn't say no to him. Harashima explains that he should have said no, then he wouldn't have increased his depts more. "Are you saying it's my fault?!" Konosuke exclaims in shock at Harashima's comment. "But I'm to blame too?" "I only said yes because I trusted him and wanted to help him!" Konosuke tells him. Harashima shakes his head and sighs, annoyed at the way Konosuke's acting. "Because he's my friend!" Konosuke declares in a defencive manner. "When you were young didn't your father teach you to cherish your friends?" Harashima looks up and listens to him, at the mention of 'father', he wonders what Konosuke was talking about. "My parents were always poor. It's how they lived and how they died. But they used to always tell me right until their deaths: 'Konosuke, always cherish your friends and trust people'. It's better to be decieved then be the one to decieve". Konosuke smiles as Harashima's eyes widen to their complete opposite of what he had been told by his parents. Konosuke laughs, "As a result of listening to them, nothing good has ever happened to me. I'm always at the losing end of things. Not to say I'm poor, and because of it my wife ran away... Leaving our son, who won't talk to me!" he then smiles peacefully, shaking his head at the memory and Harashima listens with almost complete understanding, "But, I can never forget my dad's face... when he died leaving me with those words..." Konosuke looks at Harashima who is looking at him in a netural way, not netural caring but netural understanding. He laughs, "You must think I'm an idiot. Right now I agree with you... So go on, laugh at me if you want!" Harashima looks away, still listening. "However, I won't stop playing the fool"
Harashima's face seems to be cracking with emotion, as he is forced to remember his father. He pulls himself out of it and onto his feet, be nods a bow at Konosuke who ignore it and starts to walk off. As soon as he looks up though, he stops in his tracks. As too, does Konosuke who looks up to see what Harashima had stopped. 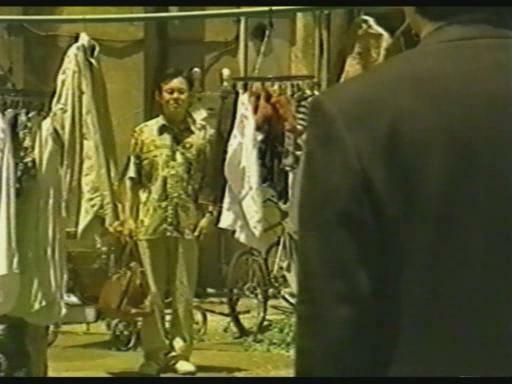 There, standing with a bag and the money was Nakahata, looking as if he was going to cry. Konosuke's face lights up and he grins, "Why you!" Nakahata falls to his knees bowing to Konosuke as if he were the king, pleading for forgiveness. "I'm so sorry! I'm sorry! I'll never do it again! Never again!" "I knew you'd come back!" Konosuke rushes up to him in joy. Nakahata cries saying that he ran away but had to come back, he was far too worried about him. Harashima looks at the too, seeing that their friendship must be a strong one. "You have to think of yourself first!" Konosuke tells him, "Where's the money?" Nakahata hands the money to Konosuke who looks at it, "Is this all of it?" "Of course! I never spent a penny!" Nakahata assures him, "It's everyone's precious pay." Konosuke comes over emotional and grabs Nakahata into a hug. Harashima watches the two of them, realising they have almost forgotten him. Nakahata shakes his head, Konosuke smiles saying it wasn't him then. He responds with a shocked noise. "You think I stole it!" he says. The two men then turn to Harashima and ask if he believes them. Harashima pauses for a moment and then asks Konosuke about his father... When he died, how did he look? Konosuke laughs and tells him that his father died with a big smile on his face. It's then that Harashima says he believes them, Nakahata explaisn to them that he's dealt with the money lenders so they won't be any more trouble and Konosuke offers to take Harashima down to Hinode, but Harashima says he doesn't want to bother telling them that he doesn't need his watch anymore. Meanwhile at the beautiful shiney Harashima building, we're having trouble. Yoshimura didn't move quick enough and now they're going to have to bid against their biggest rival the... DAOIJI GROUP... and he's sorry. Harashima says he understands and says he's trusting him to get the work done. Yoshimura leaves in high spirits and Harashima and his secretary (Don't know her name... The actress is Yoko Saito, so I call her that) are talking about him. Yoko smiles, "So is Yoshimura a possibility?" Harashima smiles to himself, "He's a candidate"
Harashima glances at her and smiles to himself as he looks over the reports. Kaori and her two new friends are working on her lovely display. Then like a pheonix rising from the ashes, there is Harashima walking in and watching her as she rushes about putting it together. She looks up and spots him, he gives a small bow and a shy smile as she quickly gets up, excusing herself from her friends. She rushes to greet him, whispering about how great it was that finally she had to helpers. "May the owner had been listening to us the other night..." Kaori says dreamily. Harashima smiles gleefully, feeling triumpth and once again finding the irony adorable. Kaori smiles back at him, "Not possible is it?" They both have a moment of chuckles before Kaori asks why he's there, "Another delivery?" "No" Harashima says, still smiling, "I'm curious about what you said last night" he explains to her puzzled face, "I was wondering why you don't want the store to fold and close"